The grand opening for the Laure Carlisle Art Studio & Gallery in downtown Paso Robles will be held on Dec. 8 from 3 to 8 p.m., and will feature light appetizers, wine, and a raffle for prizes like free art classes. Visit laurecarlisleart.com for more information. Laure Carlisle is always making something with her hands. It's been that way since high school, when she took her first art class one summer. But it did take some convincing to get her started on a creative path. "My mom was really worried about grade point averages and not ruining your chances of getting into college," Carlisle said. "She actually got permission from the school district for me to enroll in a summer art class at the junior college to make sure I could do it well enough not to ruin my grade point average." ARTIST IN RESIDENCE Paso Robles artist Laure Carlisle recently opened her own gallery space on Railroad Street. Decades later, the Paso Robles artist has helped open and run several galleries, including Studios on the Park, and worked as a commercial artist. 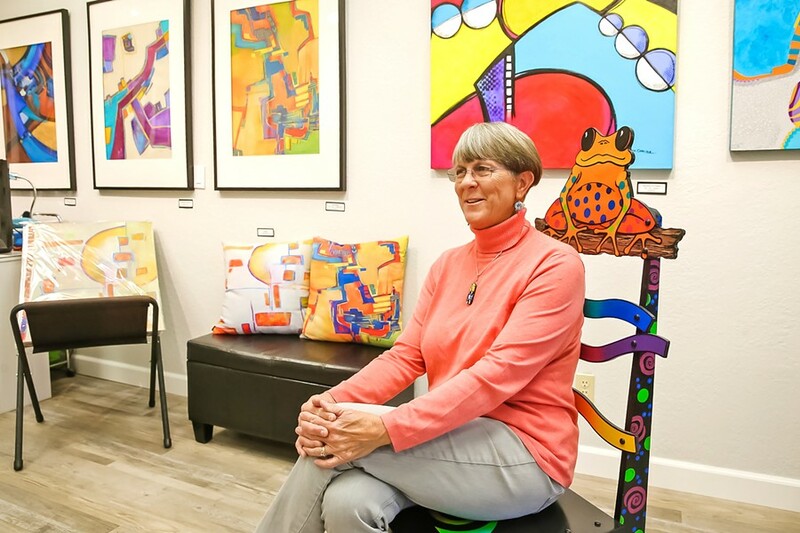 Most recently Carlisle opened the doors to her very own space, the Laure Carlisle Art Studio & Gallery, tucked away behind the movie theater in downtown Paso Robles on Railroad Street. Carlisle will celebrate with a grand opening reception on Dec. 8. 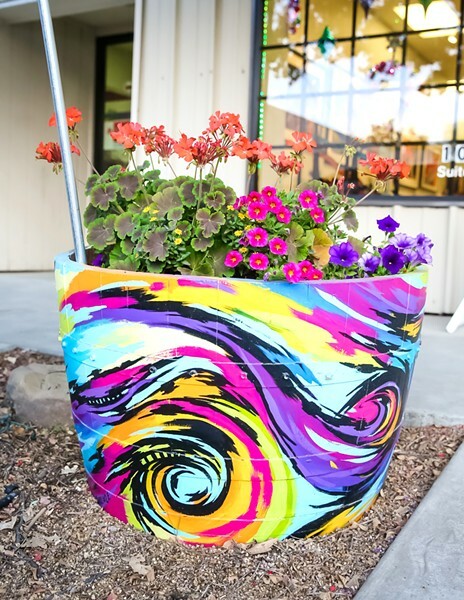 A repurposed wine barrel painted with a multicolored, abstract wave teems with a bright bushel of flowers outside the studio door, beckoning you inside. IMITATING LIFE A series of artist Laure Carlisle's more representational art focuses on common emotional experiences. "I have this need to make things. I'm happy when I'm making things," Carlisle said. "Anytime where I have a period when I don't get to be creative ... in hindsight, I realize I wasn't happy during that time. It's just something that I need to do." Every inch of cozy space in her gallery is covered with art made by Carlisle—acrylic and watercolor abstract paintings, zany chairs adorned with whimsical frogs, handmade metal and glass jewelry, Lisa Frank-style posters of tropical critters made during a commercial art phase. "If you keep producing work, it's kind of nice to have a place that people can see it," Carlisle said. "There's satisfaction in making for yourself, but after selling art for so many years, it just felt like that was what I needed to do." Every piece currently on display in the front room is one of Carlisle's favorite creations from her collection. One of the back rooms is filled to the brim with fabric creations made by an artist friend who rents out the space, another room is crammed with painted wine barrel planters for a community art project, and a final room houses every single one of Carlisle's jewelry-making tools. COMMUNITY ART The colorful wine barrel flower planter in front of the Laure Carlisle Art Studio & Gallery is one of about 100 planters decorated by local artists that will adorn the downtown Paso Robles area. One wall of paintings in the hallway features a series dedicated to common human emotional experiences, with a humorous edge. 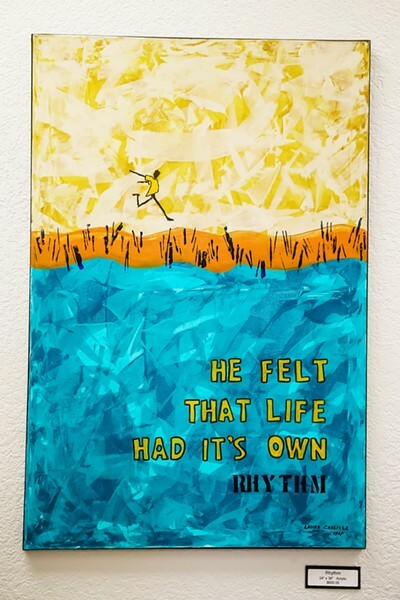 The words, "She felt as though she was walking a fine line," adorn a painting of a stick figure woman walking on a thick orange cliff. Another features a quartet of people holding up hoops, while a less-than-thrilled lady stick figure puts her hands on her hips, with the words, "She was in no shape to jump through their hoops," just below. Carlisle pays special attention to form in her work, and she refers to her style as "highly structured abstract work." Arts Writer Ryah Cooley is on display at rcooley@newtimesslo.com.